Gift vouchers are a great way to treat a fellow crafter when you don't know what they already have, have left it to the last minute or want to beat postal & weather delays! 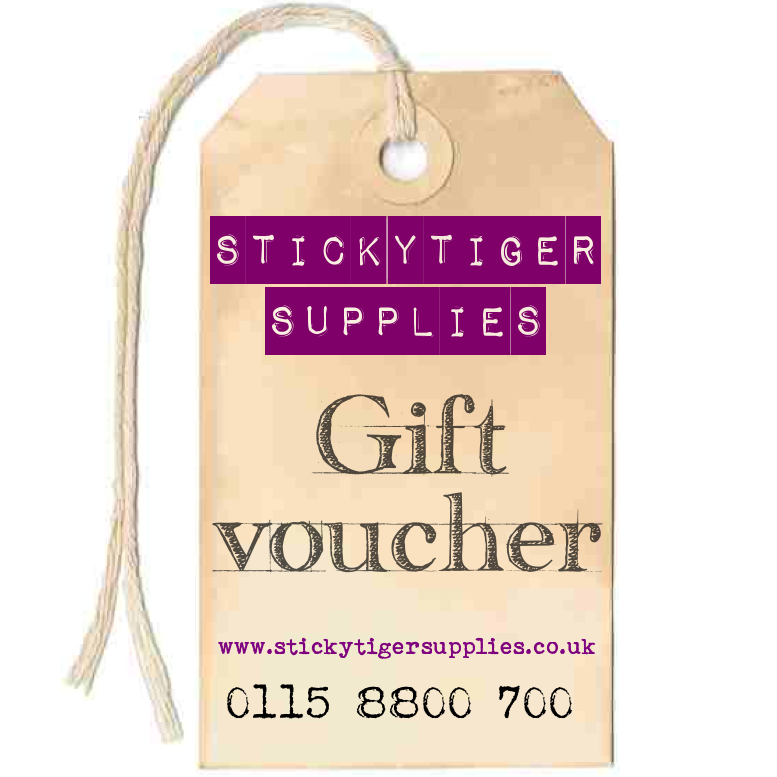 StickyTiger has a vast range of craft materials so there's something for everyone. Select the amount you wish to give & add to your basket. If you pay by an instant method (e.g. Paypal), you'll be asked after payment if you'd like to send the gift voucher to another e-mail address. You'll still be able to e-mail the gift voucher to your recipient at a later date if they lose their code, it goes astray or you don't send it at the checkout stage. You receive a confirmation e-mail containing the unique gift voucher code and, if you have chosen to do so, the e-voucher code will get sent to your recipient. If you pay by a non-instant method (e.g. Cheque), you'll receive an e-mail once your payment has cleared. The e-mail will contain a link to where you'll be able to send the Gift Voucher by e-mail with a message once payment has cleared. The amount on the gift certificate can either be deducted from an order placed (if they want an item that costs more than the certificate value) or can be used in complete payment. This e-voucher is valid for 12 months from the date of purchase and is for use online. Remember not to give the e-voucher code to anyone else!